Google-apps-script - Google Apps Script add on - How could I communicate a page with its parent (sidebar)? Google Apps Script add on - How could I communicate a page with its parent (sidebar)? My problem is that once the user picks the file, when I have the id of the chosen file, I'm not able to pass that id to the sidebar. I tried invoking someJSFunctionOfSidebar(id) and parent.someJSFunctionOfSidebar(id), but it didn't work, so I finally ended passing the value to the serverside and reloading the sidebar from there, but it's very slow and the resulting effect is ugly. Is there a way to pass a value at client level from a modal dialog created with SpreadsheetApp.getUi().showModalDialog to its parent? Perhaps it's not really its parent and that's the reason for it not working. Perhaps it's not really its parent and that's the reason for it not working. Right - there isn't actually a DOM parent / child relationship in play here. Both the sidebar and the modal dialog were launched from server-side scripts, and are independent. They can both communicate with the server, though, so you can use a store-and-forward technique to get the result from your picker to the sidebar. 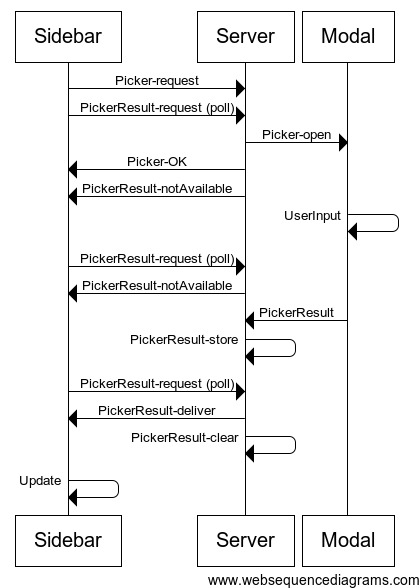 The sidebar will start polling the server for the picker's result as soon as it requests the picker's launch. The picker's result will be sent to the server, using google.script.run. The server will store the result temporarily - this could be as simple as a global variable, depending on your situation. Once there is a result, the next poll will retrieve it. Have a look at How to poll a Google Doc from an add-on for the basic idea of a poller. Sadly not. The best you can do is store the items using the PropertiesService (or CacheService if the list is over 9kb) when the ListBox is created. Then you can walk that list at will later, and use the ListBox setSelectedIndex() method if needed. Script to check for email subject not in inbox runs without error but not as expected. Not sure what is wrong with syntax.